This shovelhead video clip covers bearings, pinion shaft. This is adding bearings to the shaft before the right side of the case is installed. Very precise measuring is involved and so stated in the video. We have a new 2-DVD set called 'Building A Shovelhead Style Engine' available right now. The video clip above was taken from it. If you want to build your knowledge on shovelhead motors, or build a shovelhead engine, Get it now. This shovelhead clip covers - Ring gear to oil pump. The first gear that gets added to the bottom end. 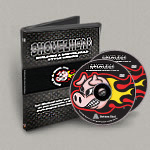 Our new 2-DVD set called 'Building A Shovelhead Style Engine' is available right now. The video clips were extracted from it...exclusively for Custom-Choppers-Guide.com. The resolution is much better on the actual DVD's. Rebuild or build a brand new shovelhead motor... or dramatically improve your knowledge of shovelhead engines Get your set now.